The OOD9 by Maxon might be a sleeper when it comes to dirt pedals. But it’s one that won’t let you down. It’s an excellent overdrive pedal. It has very low noise even at higher drive and level settings, it doesn’t remove near as much bass as the Ibanez Tube Screamer style pedals, and has a smooth yet defined top end. 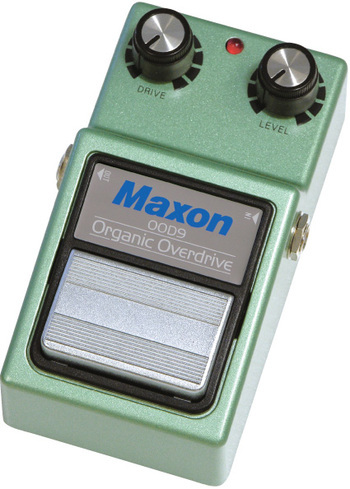 The Maxon OOD9 is based on the old OD880 circuit which is Maxon‘s first overdrive pedal designed in the ’70s, but with a twist. Instead of the 741 OP amp chip found in the original (and in the new OSD9), it uses the 4558 IC found in TS based pedals. I’m not sure if this is what gives the pedal a certain, subtle but audible warmth in the lower midrange, but it’s definitely there. The OOD9 is very versatile, and I personally don’t miss having a tone knob, at all. There is a tremendous gain available, so if you want to use it as a booster, you can definitely do that; even with the drive knob set to zero, you can push a tube (or modeling) amp into smooth distortion. At the other end of the tonal spectrum, you can plug it into the cleanest tube or even solid state amp and set the drive knob to get the amount of grit you want. If you do so, the end result will be a well defined, warm, sizzling but not overly harsh distortion texture that ranges from just a touch of “hair” to a warbling and rich overdrive, depending on where you set the drive knob. Although this pedal might not be an obvious choice for heavy metal players, plugging into an amp capable of producing higher gains will get you a unique metal tone if that’s what you’re after. The clipping diodes are tied to ground, so unlike the compressed and rubbery distortion you get with a TS pedal which has the diodes in the feedback loop, here you get an uncompressed and extremely dynamic tone that’s highly dependent on your picking strength and the guitar’s volume knob settings. It means that if you plug into an otherwise clean amp then even with the drive knob at max, you’ll get a clean tone just by picking very softly. The footswitch is true bypass, and requires quite a strong step. It can be used with either a 9V battery or a regular, BOSS-type 9VDC power supply. The pedal has an internal charge pump that will give you a stable and steady level of 9Volts in most circumstances. The construction is sturdy, this pedal is built to last. Next → Next post: Did you get the right pickups for your guitar?